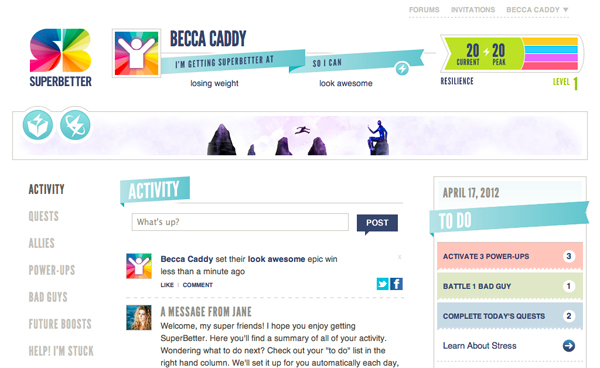 SuperBetter is a web- and mobile-based program intended to help users enhance their physical, mental, and emotional well-being, and improve their social connections. The program is designed to help users achieve multiple goals based on their preferences and motivations: beat depression and anxiety, cope with an illness or pain, recover from post-traumatic stress, improve nutrition, increase exercise, and overcome daily challenges. Based on their goals, users can complete “quests” (i.e., real-life activities such as 10 minutes of stretching), accomplish “power-ups” (e.g., drink a glass of water), and also battle “bad guys” (i.e., common bad habits/traits such as self-criticism) on a daily basis. Users advance through levels and are awarded points for completing each activity. The program allows users to focus on the quests, power-ups, and bad guys that are important to them, and to skip those that are not. Users can also invite “allies” to leave encouraging comments and suggest new quests and power-ups. Additional features include a daily wellness questionnaire and a weekly “Superbetterness” questionnaire, which are used to assess players’ progress; and external links to TED Talk videos in which the developer describes the development of SuperBetter. Unclear design and tutorial for the first-time user. SuperBetter could be helpful for users who need a structured or concrete framework through which to incorporate small behavioral changes into their lives. Attractively designed, SuperBetter offers clear, focused, and easy-to-achieve challenges. On the downside, for the first-time user, it is not sufficiently clear how to best utilize the program. The initial tutorial provides an elaborate (sometimes repetitive) explanation of the program, but does not specify how it should actually be used. It seems that the developers chose to focus more on convincing the user and “selling” the program, rather than leading them through it. Thus, when the user first enters the program, trial and error is the natural way of learning how to use the program. This process could be prevented through a salient, clear tutorial, or a better tunneled design. At the time of review, the program’s design was not organized enough for the user to understand what step to take and when. SuperBetter can be recommended as a supplement to ongoing treatment for patients who have a reasonable amount of energy and motivation. The therapist can assist the patient in selecting what to focus on in the program, and promote a discussion about the challenges the patient is facing during program utilization.